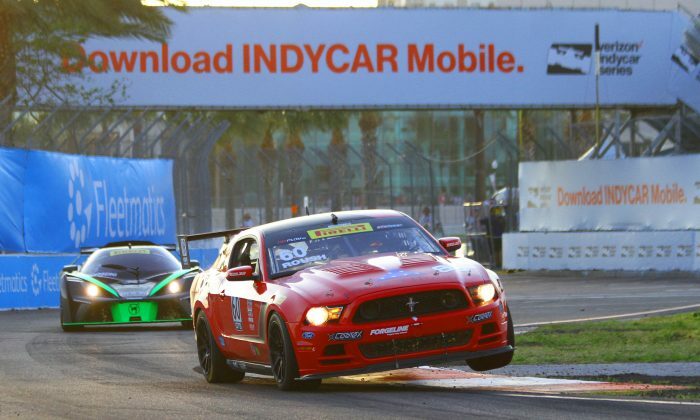 ST. PETERSBURG, Fla.—Jack Roush Jr. won his first Pirelli World Challenge GTS race Friday afternoon in a runaway. His second GTS win, in the second GTS race of the IndyCar Grand Prix of St. Pete weekend Saturday, evening, was a significantly tougher fight. Roush made a bad start, dropped to fourth, fought his way to third, and took over the lead after a restart on lap 28. He was pressured to the end by an insistent Brent Sandberg, driver of the #13 KTM X-Bow, but held off his last-turn charge. Sandberg had to be satisfied with his second second-place finish of the weekend. “I didn’t get a good start at all. I got a lot of wheel spin and I dropped to fourth,” said Roush Jr. after the race. “Then I tried to get the tires up to temperature and be smart in every turn. I was on my marks as best as possible. It was a battle the whole time. A much tougher race than Friday. 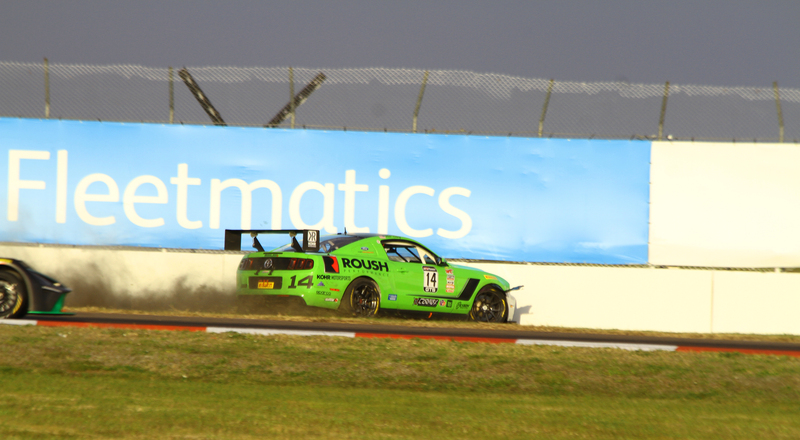 The restart from which Roush benefitted cost the race for his team mate Nathan Stacy, who was leading when he went off at Turn 13. Roush’s team mate Nathan Stacy in the #14 Roush Performance Mustang Boss 302 took the lead from the green flag, and held it after a Lap Six caution brought on a restart. Stacy’s led shrank lap after lap as Brent Sandberg pressed forward, until Lap 22, when a momentary lapse in focus ended Stacy’s day. Stacy’s wreck brought out a yellow, and on the restart Roush used his Mustang’s big V8 to power into the lead. Brent Sandberg in the #13 KTM X-Bow pressed Roush hard actually drawing level in the final turn of the final lap, but ran out of road, scraped the wall, and had to back off. “Overall, I am really happy for the crew because they worked very hard all weekend,” said Sandberg. “The track had changed today and the car was very loose compared to yesterday (Friday). I was trying to use my car’s advantages on the restart and make moves in the corners. “I was hoping Jack’s big V-8 would get some wheel spin at the restart. 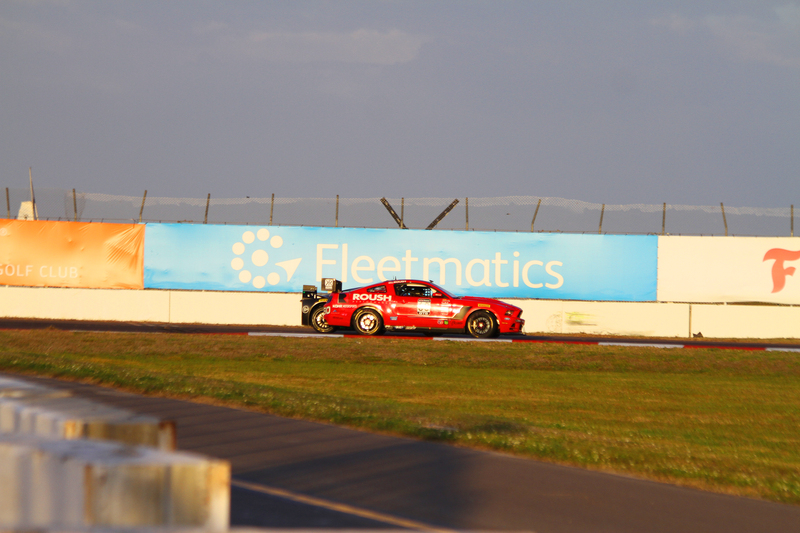 He was able to out drag us down the front straight. I was trying to bide my time and get into position to make a move late in the race. “At the end of the day, it was hard-fought battle and I gave it everything I had. I thought I had a chance in the final corner by going to the outside. I thought in my mind that Jack doesn’t know I’m here. Pirelli World Challenge heads to Long Beach for the Toyota Grand Prix weekend, April 15-17, where GT and GTA will race. 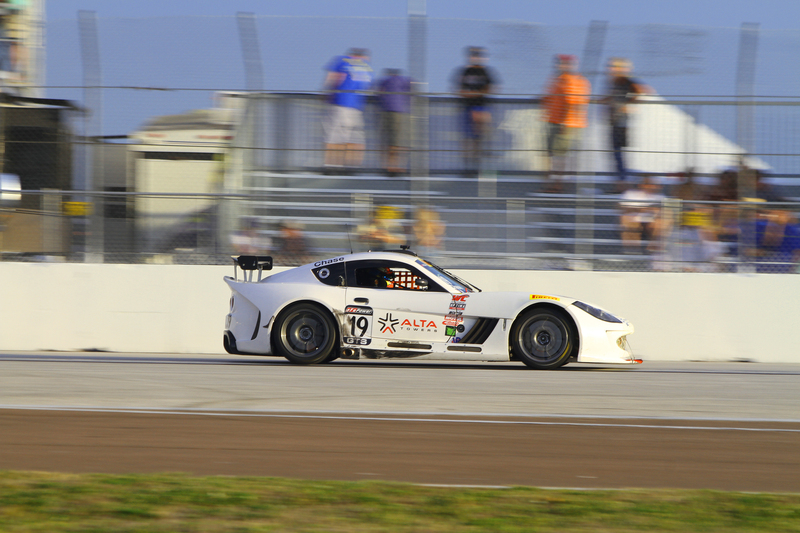 The next GTS race will be at Barber Motorsports Park, April 22–24.